Haraol Berman joins Dave each week on 4 radio stations where Jew and Christian views intersect in such a way that it opens eyes and hearts to deeper meanings of faith. Our prayer is that we find a substantial foundation to take the "Living Word" into our world to bless and encourage others. If you enjoy these programs and would like more information, please join "the boys" on facebook under "the Teacher and the Preacher." "Is there ethics involved with Technology?" "Do We Need Each Other?" When the Conversation includes an Orthodox Jew and a Christian perspective, an amazing thing takes place - we learn something new! "A New Paradiem!" A God orchestrated friendship and event. A faithful Jewish teacher who loves Gods’ Word and celebrates Shabbat each week with his wife and friends, and the Preacher who also loves Gods’ Word and spends hours of his life investing in the ministry of that Word to those God has entrusted to him. Each with a passion and fervor that makes you feel like you are in the Presence of God Himself. And, actually, you are! May I introduce to you - The Teacher and the Preacher! 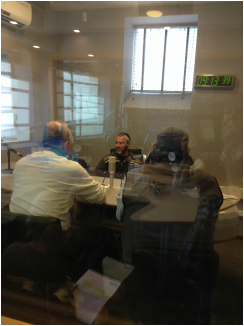 Now a dialogue and a radio program that is expanding into the very heart of Israel and the Church at large! “Hi, I’m the Teacher, Harold Berman”… “and I’m the Preacher, Dave McGarrah. . .” and the dialogue begins. The topics can be secular or religious and the points of view may differ, but the love for each never wavers. You see, it’s more than a program about a topic, it’s a model, a demonstration, if you will, of how God can bring two people together who have many differences, set those aside to show the world how we are to love each other. This could be a miracle before our very eyes! There really is something remarkable happening with “The Teacher and the Preacher” that is affecting Christian and Jewish listeners to the point that the station manager and others in the broadcasting world are sitting up and taking notice. It’s not just that there is a unique relationship developing, but that it has taken on the privilege and responsibility of taking it to the world. There is a brotherhood, a foundation of belief that has to bring us together. The Word is so powerful that in its’ study you need the perspective of both sides to allow for a fuller revelation.